Two is better than one! This statement is true for you and your loved one, it is also true when you think about romantic gifts. Send your better half the Two Romantic Surprises and prove that you can be romantic even when you are far away. 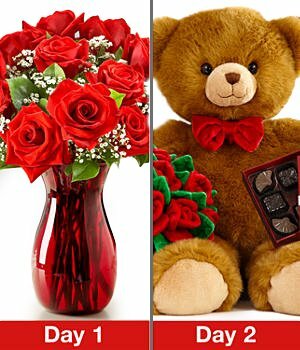 First, she will receive a bouquet of one Dozen Long-Stemmed Red Roses in a glass Vase, that will brighten her day and warm up her heart. The next day, a cuddly Teddy Bear will knock on her door (with a little help from our couriers, of course) - carrying a box of Chocolates. This bear is so adorable, he is sure to steal a couple of hugs from your loved one, but we guarantee that while doing that, she will be thinking of you and your love only!